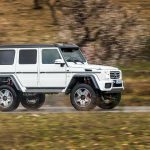 Ahead of its official debut at the Geneva Motor Show 2015 we had the exclusive opportunity to drive the Mercedes-Benz G500 4×4² Concept in Spain. 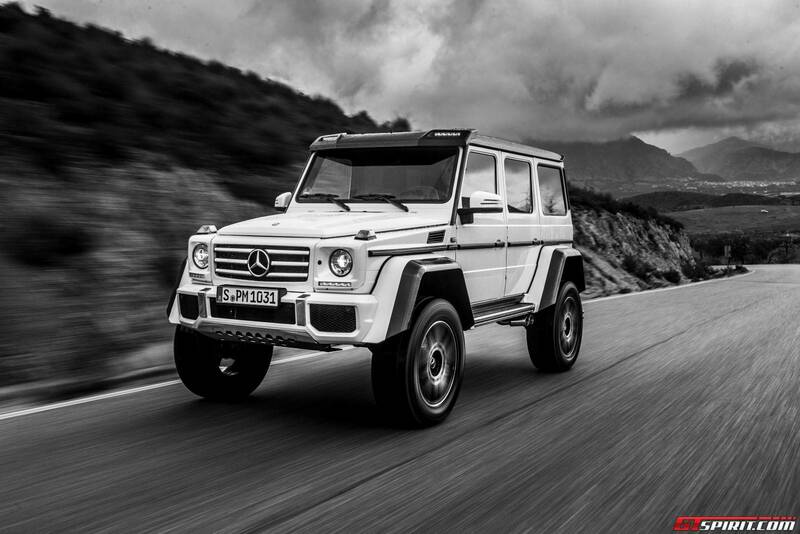 G500 meets G63 6×6! 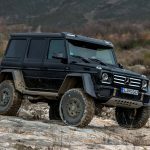 Mercedes-Benz describes the Mercedes-Benz G500 4×4² as a near-series show car, in reality it just requires testing and homologation to take the Mercedes-Benz G500 4×4² Concept to production. A decision hasn’t been made yet, but we deem it highly unlikely that this car will not make production. 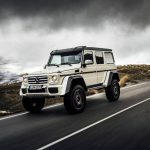 The G500 4×4² is the next step in the now 36-year long history of the G-Class and follows the incredible success of the G63 AMG 6×6, which is now officially sold out. 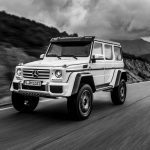 The Mercedes-Benz G500 4×4² comes with a brand new V8 which is related to the new AMG V8 found in the new AMG GT and C63 AMG. The 4.0 V8 features a hot inside-v where two turbochargers are mounted inside the V8. This makes the engine considerably smaller and more efficient. It produces 422 hp and 610 Nm of torque, enough for a 210 km/h top speed. With a weight of 2,980 kg don’t expect a new 0-100 km/h record, but once the car is moving the new engine packs a lot of punch and it didn’t particularly feel shy of power. 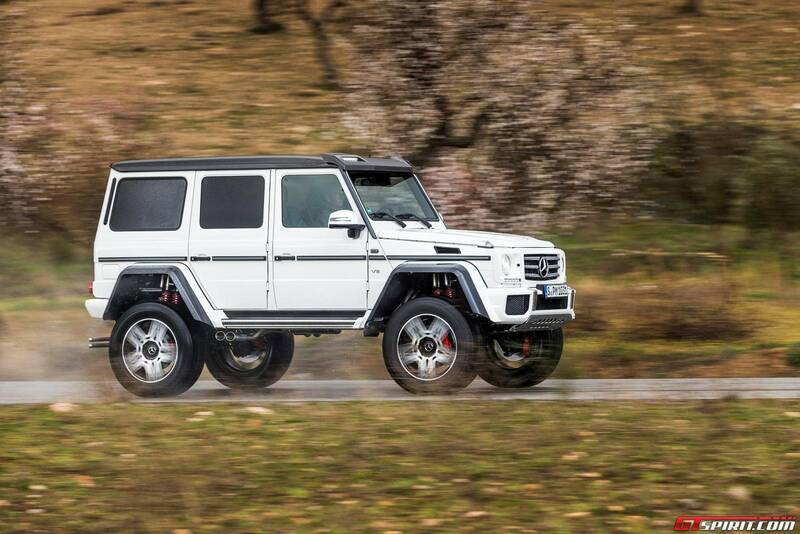 The most significant feature on the new Mercedes-Benz G500 4×4² are its portal axles. 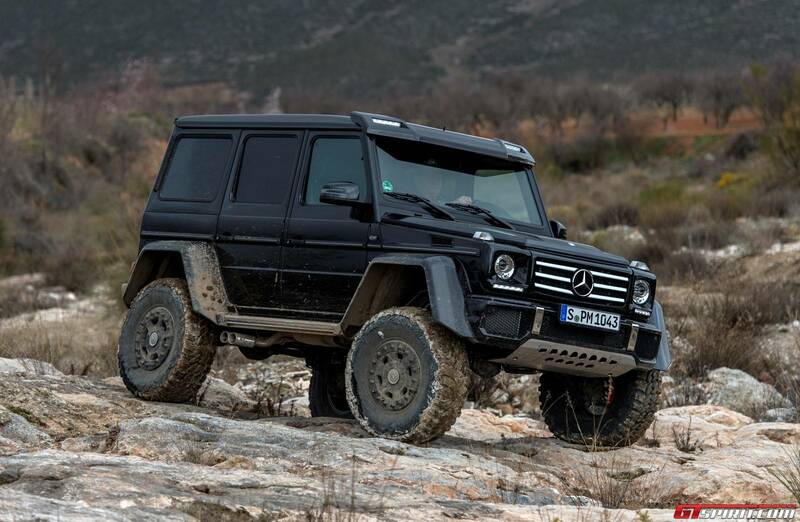 In setup quite similar to the G63 6×6 but shortened by one axle. To further improve handling of the ‘Hulk’, as it was dubbed after first spy shots, the suspension has been extended with two springs and damper struts per wheel, a setup derived from rally sport. 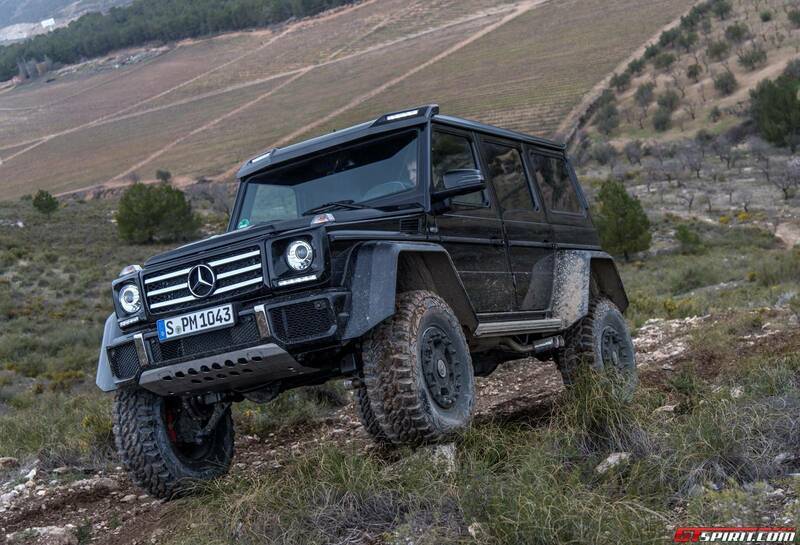 On the G500 4×4² it has been extended to aid sportiness. Per wheel, one damper can be set electronically between Comfort and Sport mode to give a harder but sportier on-road driving experience. 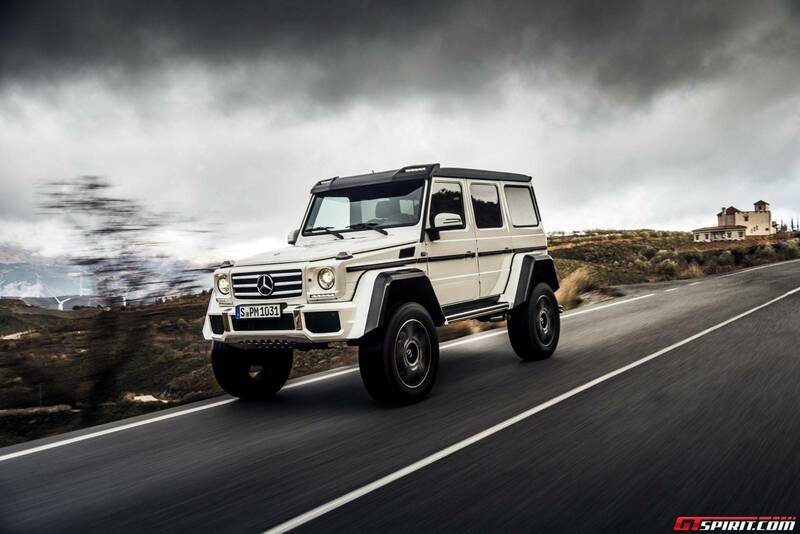 The portal axles give the 4×4² a ground clearance of 45 cm – 24 cm more than a regular G500. 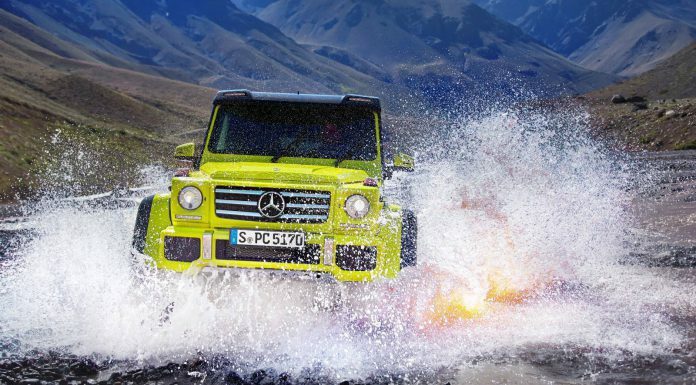 It is more than enough to drive over extremely rocky terrain and wade through up to 1 meter of water. But just in case you do meet that 50 cm high rock, Mercedes-Benz mounted an extremely robust stainless steel under guard to protect the car. 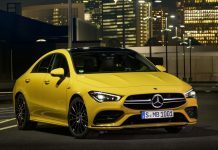 Thanks to the larger wheel arches and wheels the overhang in the front and back have been reduced even further and you can drive up approaches of 52 degrees easily. That is only 36 degrees for a normal G500. 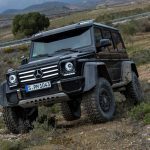 The portal axles usage on G wagons find their origin at the military and they have been tested through and through in the toughest conditions you can imagine. 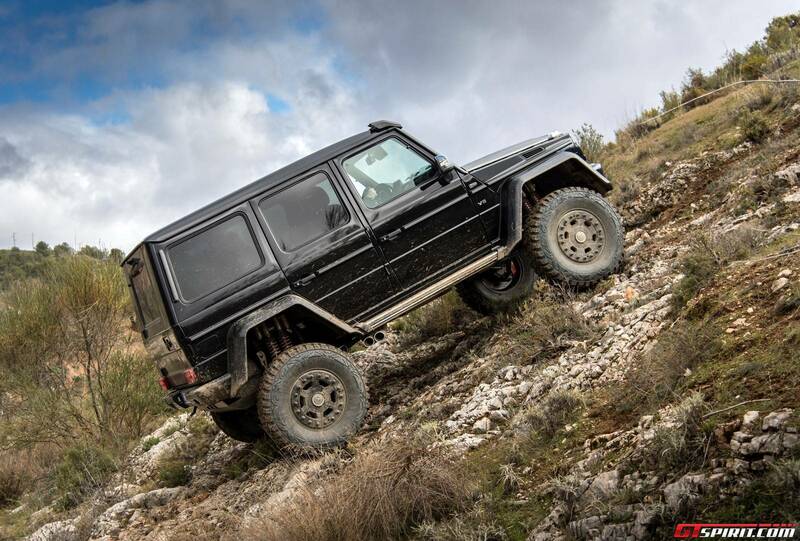 But before we tell you our off-road story we go back to the road. 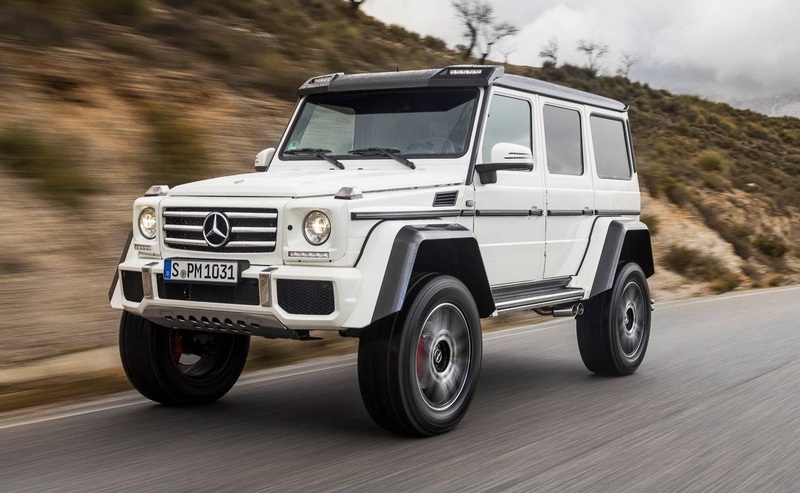 As we come flying round the sharp left hander the Mercedes-Benz G500 4×4² leans nowhere near as much as a normal G500. And with hindsight an even higher cornering speed would have been possible. 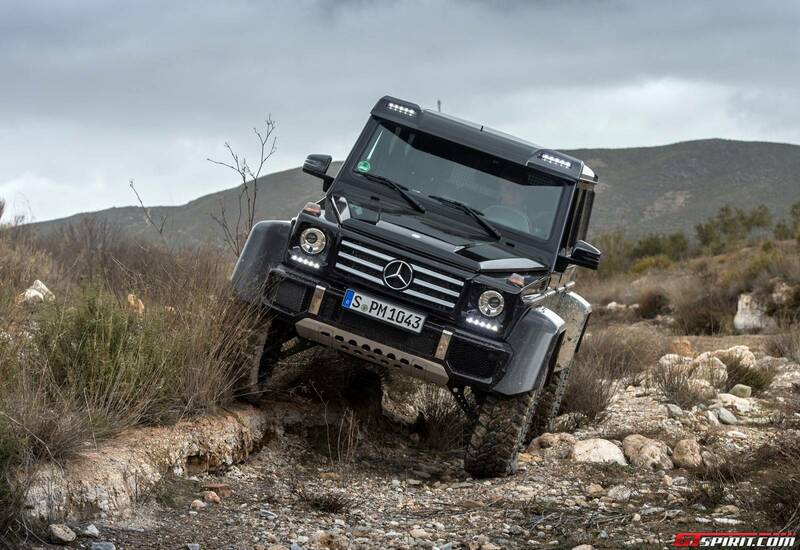 This incredible cornering capability is almost entirely due to the wider track and suspension of the 4×4². With a width of 2.10 meters it is quite a bit wider than a regular G500 and that reduces the typical body roll significantly. The wider track also increases stability of the new monster G. On our drive from Malaga to Granada in Spain heavy winds were trying everything to throw the G 4×4² off its course but under power the G would just push through and stay on track. Only when you sail the wind gets a little grip on the car. On the Spanish highways driving the G500 4×4² is a surreal experience, even the tallest of normal SUVs, the Range Rover, looks small. The only people at eye height are truck drivers, who mostly stare back in awe as we pass them. The top speed is officially limited to 210 km/h but with strict speed limits and traffic we haven’t been able to come close. At 130-140 km/h, it drives easily and comfortably. 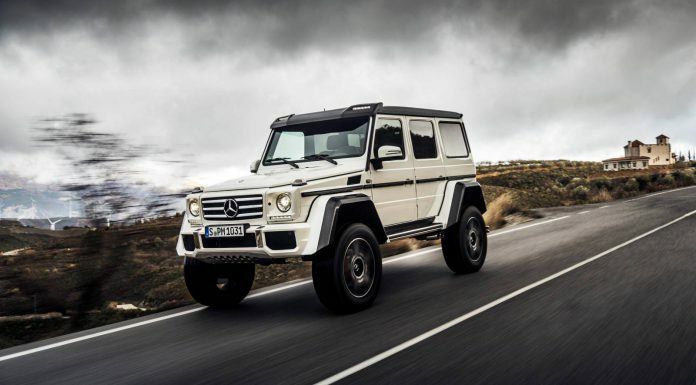 One of the benefits of this new G500 4×4² in comparison to the G63 6×6 is that you don’t need a truck license to be allowed to drive one on public roads. We leave the motorway and make our way through some stunning and remote areas of Andalusia. Winding roads past farms full of olive trees and up empty mountain passes. We toggle through the different modes for suspension and drive train. 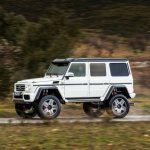 Mercedes-Benz emphasizes that the chassis and many of the drive components are the same as on the G500, which makes the car very recognizable and easy to drive for anybody familiar with a regular G-class. One of our favorite sounding cars of the last decade is the normal G500 with its naturally aspirated V8. With ever stricter emission regulations its inevitable that most large displacement, naturally aspirated engines will be replaced with smaller turbocharged engines. So how does the new 4.0 V8 compare to the old 5.5 V8 in terms of sound? Well, it still sounds like a typical AMG V8, loud, angry and ready to attack. But the character of the sound changes with the revs and throttle input – more so than in the ‘old’ V8. Overall the volume seems a bit lower, which can be a good thing on long journeys but might score slightly lower in the show-off department. On the other hand you don’t really have to worry about anybody not noticing you when you drive down the boulevard in Cannes with the G500 4×4². In Granada a beautiful off-road area is waiting for us to explore. 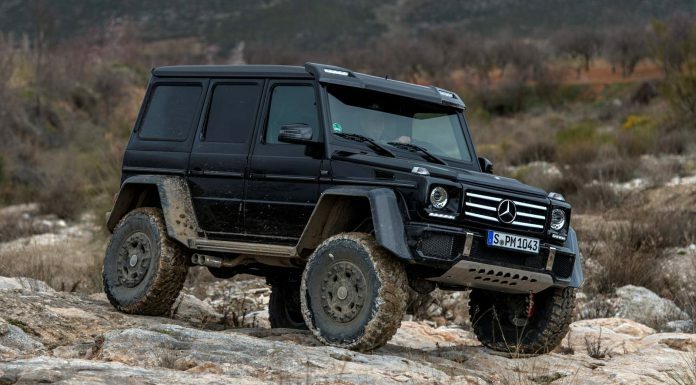 But before we can let all hell loose with the G500 4×4² in the mud we change the wheels and tires. 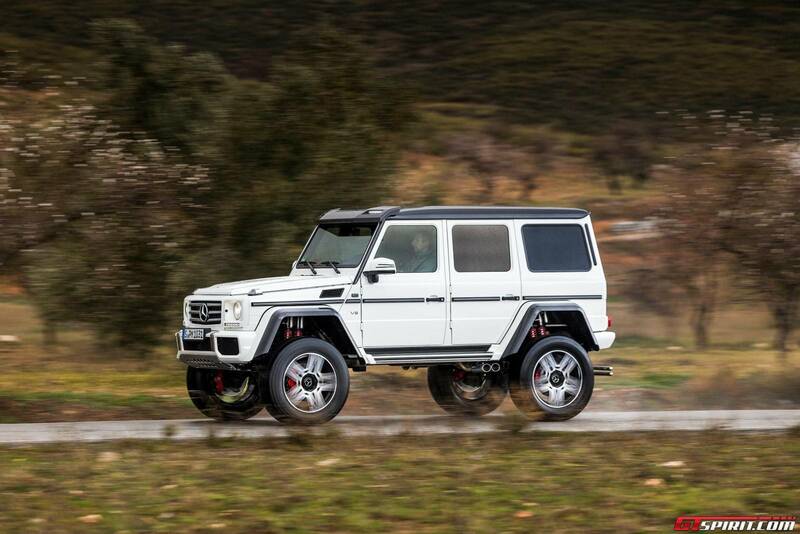 The Mercedes-Benz G500 4×4² comes with two sets of wheels and tires. One 22 inch road set with a top speed of 210 km/h and decent off-road capability and one off-road set with special 18 inch beadlock wheels and off-road tires for the real off-road duties. The two piece beadlock wheels have the tire pinched in so tightly between the wheel halves and the inner beadlock ring that the tire cannot slip off the rim even when the tire is completely flat. This has the advantage that you can drive with extremely low tire pressures (below 1.0 bar) for maximum grip in loose sand – per example in the desert in Dubai. 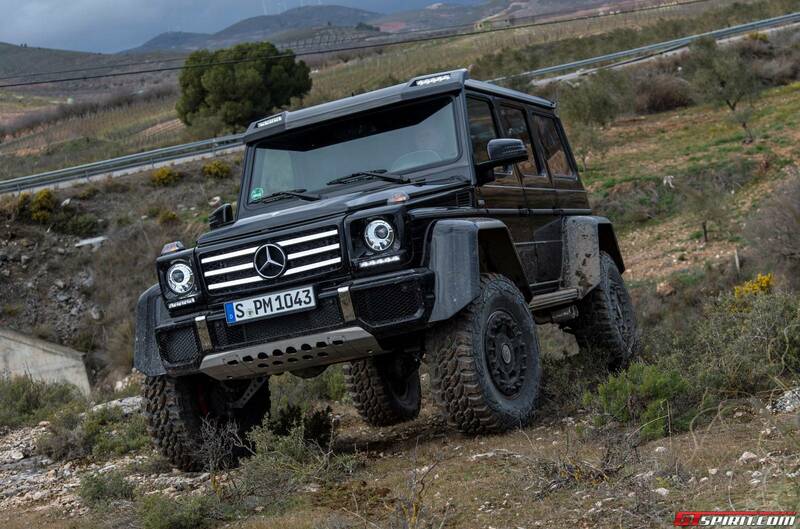 With the off-road tires mounted we set off on a course through a dried up river bed. 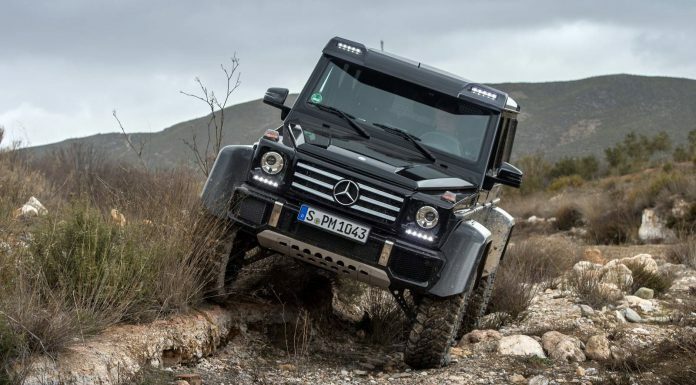 The first bit is quite gentle but a few rocks would make it impossible for a normal G wagon to drive the path we are following. Further down the river is not so dry anymore and large mud pools and vegetation provide interesting obstacles. Three differential locks and low range allow us to drive through it without any issue. At the end of a narrow path that the Mercedes-Benz test driver refers to as ‘the jungle’ we have to make a three point turn before diving nearly vertically into half a meter of water. I fear a giant rock on the left side of our way out of the pool might stop us in our track but the 4×4² just goes up and over it. We drive back through the jungle and drive up a hill through a field with olive trees into a steep rocky area. Here we fear for the wide carbon fenders but luckily we make it to the top without scratching them on any of the huge rocks. Afterwards we learned that the precious carbon fiber fenders can easily be removed prior to serious off-roading and mounted back on before going on the road again. On the way down again we just let the G500 4×4² roll in first gear without touching the brakes once. 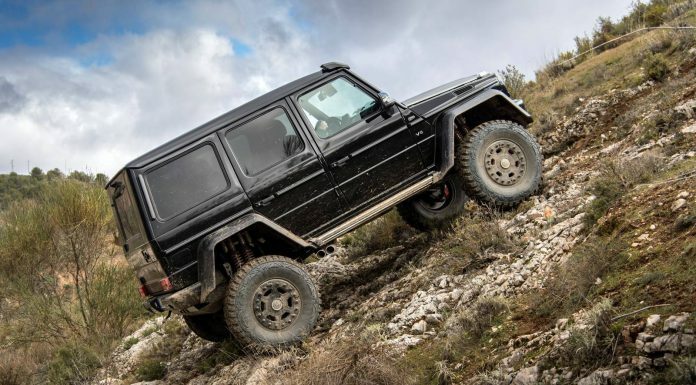 Even steep inclines are not a problem and almost feels as if we are driving a nimble version of the Unimog – one of the, if not the, best all terrain vehicles in the world. As the day progressed we also joined our test driver in the passenger seat for a couple shake down laps in the dirt and up a hill that no car had driven on before. It is truly impressive how much this car can take without a single hiccup, error or even the slightest damage. 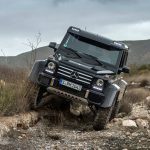 So what is it like inside the Mercedes-Benz G500 4×4² Show car? As you can imagine getting in takes some practice, especially when you climb in- and out on steep hills like we did. But once you are in you have a majestic view around. The designers used a combination of black Designo leather and Dinamica inlays on the seats and panels. Carbon accents finish the design. 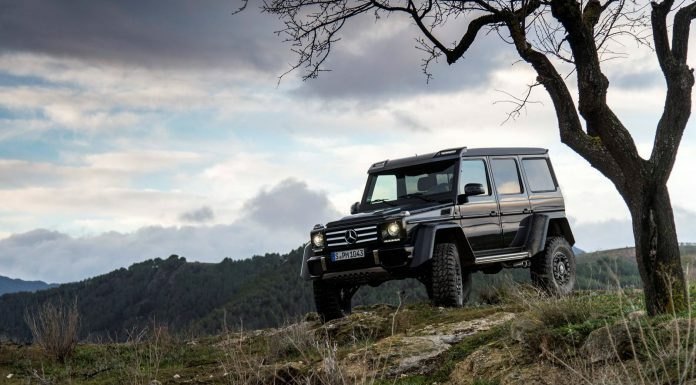 Dimension-wise the G-wagon has changed very little since its inception in the late 1970s. This has as drawback that for taller people the interior space is somewhat limited, the G500 4×4² is no exception to this. Some aftermarket companies offer solutions like longer mounting rails for the front seats to improve leg room though. 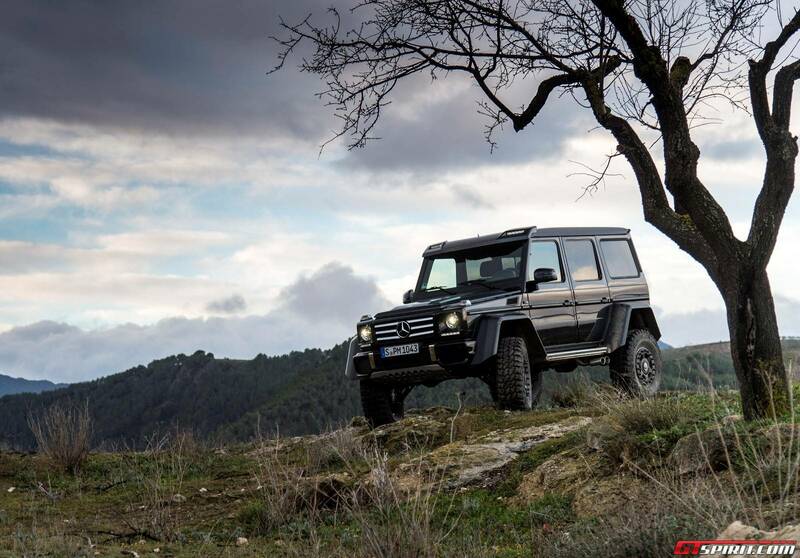 Mercedes-Benz also gave us an explanation about the name; Mercedes-Benz G500 4×4². 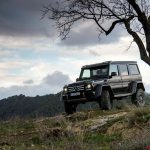 The 4×4 squared emphasizes the two dimensions that the Mercedes-Benz G500 4×4² is aiming to excel in: on-road and off-road. 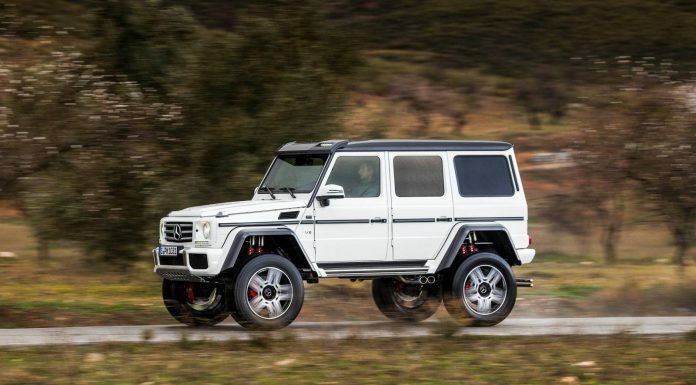 Mercedes-Benz promises that the before the G-wagon will ever be round, the world has to become square and boxy. 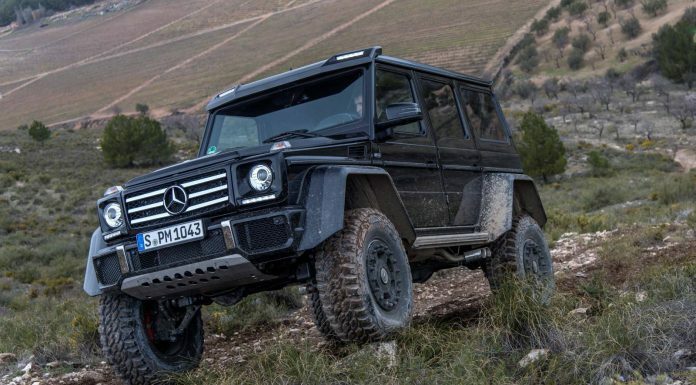 Coming to a conclusion about the G500 4×4², we have to say it is the most capable street legal all terrain vehicle we have ever driven. And thanks to being shorter and lighter it is more usable than the 6×6 without losing much of its outlandish street presence. It is the coolest thing on four-wheels that we hope to be able to buy soon. The production decision is still pending but we are quite confident it will make production. 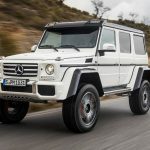 And once it does we expect it to be a fair bit cheaper as the G63 6×6 AMG which came in close to 400,000 euro, we expect the G500 4×4² to get a price tag closer to 220,000 euro. 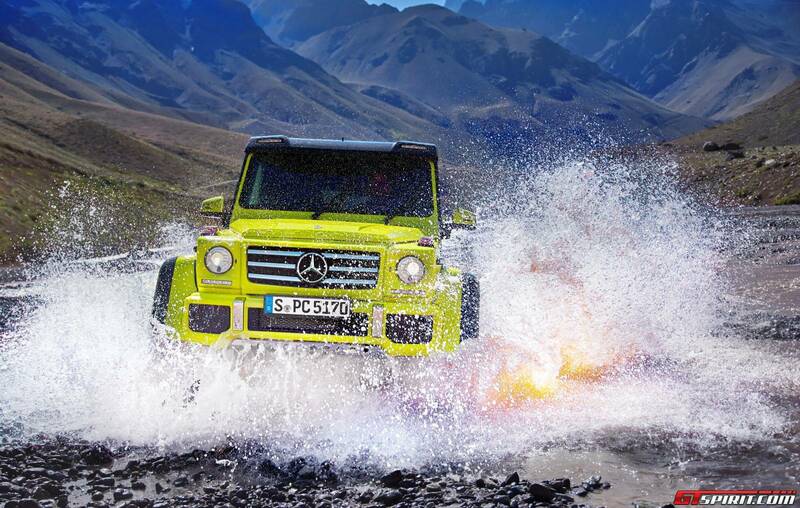 Finally asked why they built the G500 4×4² show car, the Mercedes-Benz G-Class director replied: “Because we can!”. 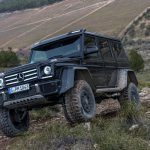 And we believe that, all off-road supremacy aside, that will also be a key argument why many people will buy the G500 4×4² when it goes into production.